If you have ever felt that your holiday photos never quite capture what you felt at that moment, just wait until you take our tour to Australia. More of a continent than an island due to its enormous size, Australia is a vast ensemble of sea and coral reefs, an exotic universe of wild plains and Aboriginal culture which fill the vast deserts of the interior to this day. 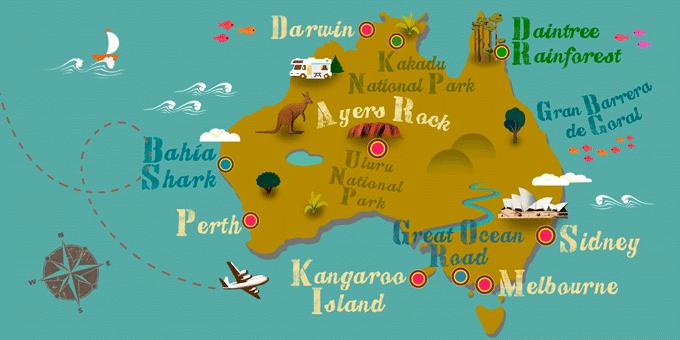 Australia is also an example of a vibrant cultural offering, as you will discover in Sydney and Melbourne. Not to mention the incredible fauna, which can only be found in Australia: there is no feeling like finding yourself face to face with a wild koala or kangaroo for the first time, whether on an organised excursion or on your own. Australia is, nothing more and nothing less, than the other side of the world.